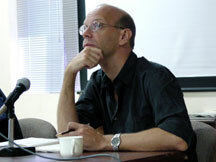 Geert Lovink (NL/AUS), media theorist, net critic and author of Dark Fiber, Uncanny Networks and My First Recession. Co-founder of Internet projects such as The Digital City, Nettime and Fibreculture. He is founder and director of the Institute of Network Cultures, professor at Interactive Media (Hogeschool van Amsterdam) and associate professor at the Media & Culture department, University of Amsterdam. He holds a PhD at the University of Melbourne and did post-doc research at the University of Queensland. In 2005/2006 he is a fellow at the Berlin Centre for Advanced Study.